Be it Vinyasa, Ashtanga or Hot Yoga, find your perfect Eco-friendly Yoga Mat! Eco-friendly yoga mats are available in various avatars today. Each one designed to suit a specific yoga practice. If some yoga mats are well suited for vinyasa, others are better suited for sweaty hot yoga. We’ve rounded up the best eco-friendly yoga mats that will meet your specific yoga practice needs. 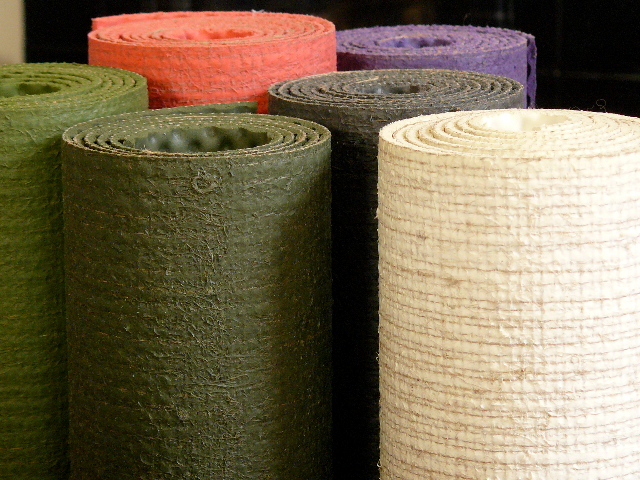 These yoga mats are not only non-toxic but also recyclable. So they are good for your body, mind, soul and the environment. TPE, Natural Rubber, Organic Cork, Jute, and Cotton go into making these natural yoga mats. You can rest assured that they are free of harmful PVC, Chloride and Synthetic Chemicals. Go on and make that switch to environment-friendly yoga mats with the help of our 15 best eco-friendly yoga mats. These eco-friendly yoga mats are made from premium quality open-celled natural rubber. No PVC, EVA or other synthetic rubbers go into the production process of the mat. One of the best non-toxic yoga mats, it offers great traction and grip even through perspiration. Jade Harmony natural rubber yoga mats are available in 17 cool colors. Jade plants a tree through their partners, Trees for the Future every time you buy a yoga mat. They’ve planted over 1.5 million trees so far! Buy this Now. Photo Courtesy: Barefoot Yoga Co. The Original Eco Yoga Mat from Barefoot Yoga is one of the best eco-friendly yoga mats available today. This natural yoga mat is made of natural rubber (contains some latex) and jute fiber with no chemical additives used. Its rubber underside grips the floor while the jute fabric/rubber mix on top offers superb traction – even in a heavy sweat. It is a highly durable, tactile, and pleasantly natural surface to practice on. Buy this Now. Light and portable, this yoga mat sports a wet grip surface with a pleasant rippled water pattern, hued in Acai. The top surface is made of proprietary closed-cell natural rubber that is harvested under regulations and is not the product of Amazonian trees. The mat uses a unique softening process free of oil-based products, toxic materials, and foaming agents. Buy this Now. Guru’s bestselling Roots Yoga Mat is among the top-rated eco-friendly yoga mats. 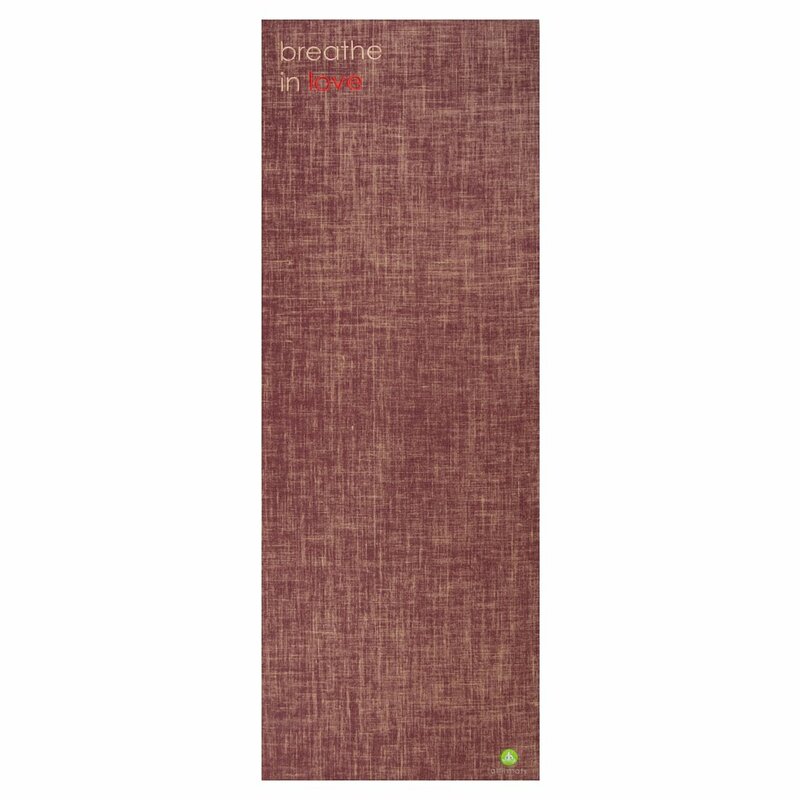 This yoga mat is made from natural and sustainably sourced cork layer on top and natural rubber layer on the bottom. Cork being naturally antimicrobial, keeps your mat odor-free without the use of sprays or cleaners. It’s waterproof and non-slip surface can handle your sweatiest of the practices. 72″ by 25″ in size, this yoga mat is ideal for both indoor and outdoor usage. Both surfaces being natural and grippy, you use either side depending on your mood and setup. Gurus also plant a tree with every mat they sell through their partners, Trees for the Future. Buy this Now. The Prana E.C.O yoga mats are constructed from 100% Thermoplastic Elastomer (TPE). These mats are recyclable, UV resistant, lightweight, PVC and Chloride free. Their closed-cell construction prevents germs from absorbing into the mat. The two-sided textured surface on these yoga mats provides superior cushioning and excellent grip on hard surfaces. Buy this Now. These cork yoga mats are constructed from sustainable cork on one side, and eco-friendly, lightweight TPE on the other. The closed cell design seals out germs, odor and bacteria. With dimensions of 68″ by 24″, tall people might find it a bit small. At 6mm thickness, it offers superior cushion and support. Buy this Now. Natural Cork makes up the surface of this eco-friendly yoga mat. Cork surface is naturally anti-microbial, is free of PVCs and chemical components. The bottom surface is made from eco-friendly dense foam containing no toxic materials. It offers amazing non-slip grip even during the sweatiest routines. From Vinyasa to Ashtanga, it is well suited for all restorative yoga practices. You may opt for the Yoloha Native Yoga Mats for a sweaty session of Hot Yoga. Weighing at just 2.5 lbs, it’s one of the best yoga mats to carry whether to your studio or to the beach. Buy this Now. One of the best non-toxic yoga mats, this mat is made from a blend of biodegradable jute and ECO-PVC. Free of Latex, Metal & Phthalates, these mats help reduce carbon footprint caused by the chemical based products. Jute also makes it slip resistant. Buy this Now. Emphasizing on preventing germs, odor, and sweat from penetrating the surface, this eco-friendly yoga mat uses closed-cell technology to facilitate better cleaning. Dragonfly TPE Lite Yoga Mat is made of recyclable and biodegradable materials containing no PVC, Latex or Natural Rubber. At 3mm thickness, these yoga mats are extremely lightweight (about 1lb) and can even handle Hot Yoga sessions with ease. Buy this Now. Best for beginner yogis, this organic yoga mat has great cushioning and optimal grip. The embossed alignment lines guide the yogis during yoga poses. Latex-free, PVC-free and chloride-free, this non-toxic yoga mat is hypoallergenic. It is a lightweight yoga mat that you can carry around with ease. Buy this Now. These non-toxic yoga mats are made from organic jute fiber and PER. The dual layer technology of this natural yoga mat also makes it a luxurious mat. The top layer has textured high-performance grip and the bottom has a non-slip finish. When combined, the thickness of this eco-friendly mat is 5mm. It is not only thicker but also longer and wider than the other mats in the market. This organic yoga mat comes with 100% cotton carrier strap making it easy to take your yoga mat wherever you go. It is going to last you for years and will keep getting softer. This is the nature of jute, one of nature’s most sustainable forms of fiber. Buy this Now. Made from organic cork and natural rubber, these eco-friendly yoga mats use no harmful chemicals. No glues, TPEs or PVCs. Furthermore, the cork and rubber trees are not harmed due to their sustainable harvesting practices. No plastics in production process and packaging, making them both biodegradable and recyclable. This non-slip mat with natural rubber bottom is good for hot yoga sessions too. These easy to clean yoga mats are also portable, thanks to the yoga mat strap that comes with it. Beginner or a pro, aerobics or pilates, this is your go-to natural yoga mat. Buy this Now. Handwoven in India, these 100% cotton yoga mats provide a firmer grip while sweating, unlike the rubber or PVC plastic mats. The natural fiber absorbs moisture and provides it the superior grip. These are well suited for most surfaces like grass, sand, textured tiles, and carpets. These lightweight yoga mats come in 72″ X 25″ size. They come with 15 years warranty and a part of the sale goes towards a child’s education in India. So this Eco-friendly Yoga Mat is an investment in good karma too! Buy this Now. Get this yoga mat if balance and alignment are key in your Yoga practice. Made from naturally sourced sustainable rubber, these eco-friendly yoga mats have alignment markers. They give you the absolute sense of balance and alignment during your yoga session. Made with planet-friendly materials, this is also one of the grippiest yoga mats. While it takes care of the grip, it also gives you more space than other yoga mats with 72.8″ length and 26.8″ width. Free from PVC and toxic glues, this is your sustainable, firm, grippy and spacious natural yoga mat. Buy this Now. Here’s an all-natural yoga mat made from organic cork and tree rubber. No trees are cut in making of this eco-friendly yoga mat. The company also ensures the cork surface does not chip. The cork surface is naturally antimicrobial and so the germs, odor, and bacteria stay away. The non-slip surface of this yoga mat provides grip for the sweatiest yoga sessions. So whether it is for hot yoga or meditation, this is your best companion. Buy this Now.